Can your Love Relationship be Saved? Does it feel like you and your partner are competitors instead of allies? Have the small kindnesses vanished from your daily interactions? Are you walking on egg shells for fear of saying something that will cause conflict, anger, or hurt? Do you avoid each other more than seek one another out? When couples come for counseling because their relationship is in trouble, as a therapist my main goal is to watch for and understand the patterns that inevitably show up in a couple’s interactions, so together we can understand what is going wrong despite their best efforts. It is incredibly helpful to examine arguments because they are never about what they appear to be. That bears repeating: while couples get caught up in the details, the argument is almost never about what it appears to be. There is an important theme playing out as that conflict and BOTH partners are engaged in the dance that fuels it. Identifying the theme is the critical factor. I believe we are always doing our best in the moment with the tools we have, but many of us didn’t witness healthy relationships in our parents’ interactions, and our awareness and skills need improvement. To be emotionally close to someone as we are in the early days or years of a relationship is a magical thing. To be in conflict with the person who we deeply love causes us immense anxiety, pain, and sadness—so why would we purposely inflict those feelings on ourselves if we knew how to avoid them. Love relationships are amazing structures that can teach us about what we didn’t get growing up. We need to figure out what that is or we’re destined to seek it, unconsciously, in this relationship, and the next, and the next—usually in ways that leave us feeling alone, misunderstood, and end up sabotaging the partnership. Effective counseling requires that couples come out of their corners in the boxing ring and embrace a new position with regard to the relationship—a united front of honesty, curiosity, and collaboration. Yes, I know … much more difficult than it sounds. That’s why an objective and caring intermediary—pastor, therapist or counselor—can be vital. When couples are trying to fix their problems from a place of fear—which is the source of all conflict—solutions are extremely difficult to recognize. I support clients to identify that fear and investigate it with deep compassion. – what will you do with the kids? – you just don’t have the time–maybe next month, next year, when you finish ….. If you have little experience with therapy–or to be exact, psychotherapy–the idea can be scary, even overwhelming, so much so that rather than reach out for help, we can spend years living a life that is far from filled with the happiness and fulfillment we deserve. If our lives are chaotic, the evidence of something wrong is staring us in the face. However, often we have no idea of the cause of our sense of being stuck, sad, anxious or depressed; life may look fine on the outside; but inside we know something is wrong. Poor or absent parenting, trauma, and losses can undermine our ability to establish healthy boundaries for ourselves, set goals for our wellbeing and growth, and enter relationships that nurture us. Instead, we may develop self defeating behaviors that trap us in a never ending cycle that damages our sense of self and inhibits our confidence and ability to attract healthy partners, maintain loving relationships, and parent well. The truth is that a ‘good” therapist is one that makes you feel comfortable, welcome, and safe to open up to. There are dozens of theories that therapists will draw on and perhaps one or more that they will specialize in, but the truth of the matter is that we sense when we have found the right therapist for that moment in time. It may take several sessions for us to be able to share very vulnerable parts of ourselves, but usually if we follow our intuition in the first meeting, we know if we’ve found a good fit. Therapists come in all shapes and sizes. Some are more formal, some more relaxed, more serious or less serious, listening oriented or action oriented, more directive or less directive, give assignments, don’t give assignments. Some therapists will have a fixed approach or style and others will have an eclectic style and adapt their expertise to best fit the client needs or wants. If you talk or meet with a therapist for the first time, you should get a really good feeling and want to go back. If this isn’t the case, don’t worry; call the next one on your list. Helpful tips when looking for a therapist …. 1. If you have insurance, call your plan to find out what your mental health benefits cover. Every insurance is different. Establish if you have an HMO or a PPO. Some have deductibles before the insurance will start paying for therapy. 2. Ask your doctor, other health professionals, or consult community resources (your church or local associations) for referrals to therapists. 3. On the Web search for therapists in your area or cross-reference referrals you receive to see if there is information about therapists in your area. Many post bios and may have websites. 4. See how quickly the therapist calls you back. Ideally, you should receive a return call within 24 hours; if it’s longer than that, this may be an indication that the therapist has a heavy client load and may not be the optimal choice. 5. Does he or she sound warm, friendly, and compassionate? 6. If utilizing insurance, availability or financial considerations are a deal breaker for you, be up front about your needs or limitations. Better to find out at the start that something will or won’t work. 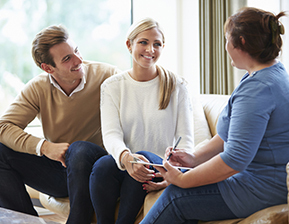 If a therapist does not take your insurance, they may be open to a reduced fee that aligns with your budget. 7. Keep in mind that good therapists will have your best interests at heart. If they don’t feel they are a fit for your situation or can’t work within your limitations, they will be honest and try to direct you elsewhere. 8. Keep in mind that therapists have specialty areas such as individual therapy, family therapy, child therapy, working with adolescents, etc. Don’t’ be shy about asking the therapist to talk about themselves, their experience, strengths and preferences. You are the consumer of their services and this is an investment of your time, energy and money. Just as beauty is in the eye of the beholder, notions of perfect or imperfect are simply constructs of the mind created by our thoughts. Even so, striving to be perfect is a dangerous dance that can render our lives constricted and lonely, and rob us of all kinds of opportunities. Our culture fuels a paradigm of achievement, productivity, and goal attainment and the upshot is that we can easily lose perspective on what it means to live well. We become more absorbed with our children’s grades than by their enthusiasm for learning and immerse ourselves in measuring our looks, our waists, our pocketbooks, our paychecks, our academic and professional accomplishments. Ironically, in the excessive amount of time spent judging ourselves for our perceived shortcomings, we miss the splendor and magic of the moment. We disconnect from living—humans doing as opposed to humans being. And when we’re not present centered, we can’t authentically connect with others. My mother used to tell me, “If you can’t do it right, don’t do it at all.” While I know she intended well and was urging me to adopt high standards, I had the good sense to replace that phrase a long time ago and adopt a kinder mantra. “Progress not Perfection” is a saying I learned from working in the recovery community. There’s freedom and encouragement in this approach to living that spurs me on to try new things, set realistic goals, strive with balance, and focus on the experience, not the outcome. Life is messy and relationships are messy, and that’s okay. The truth is we’re on a fantastic journey that is about exploring, unfolding, and expanding our minds. Our spiritual and psychological growth depends on making mistakes. Frustration and failure are really our friends, not our enemies. They stimulate perseverance, patience, compassion for others, and creativity. 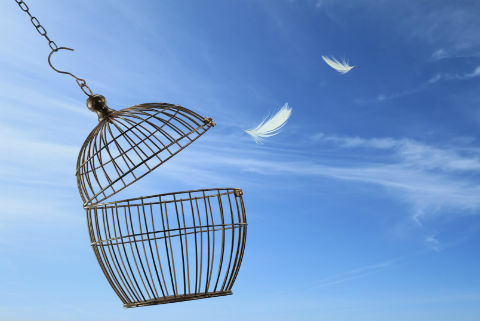 To be the best we can be, paradoxically, requires that we choose to relinquish the limitations of self- imposed demands, surrender to the process of life, and fly free.